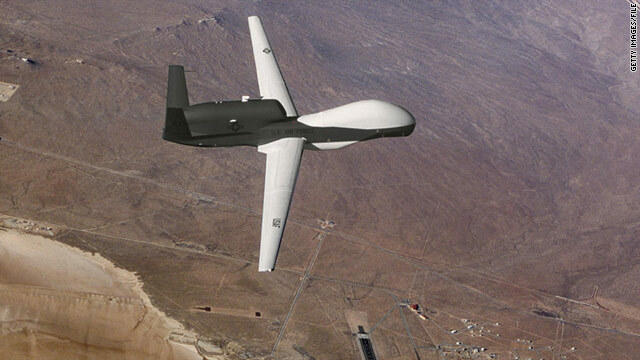 An undated U.S. Air Force handout photo shows a Global Hawk unmanned aerial vehicle during a test flight. Mexico City (CNN) -- Mexico on Wednesday admitted that American unmanned drones operate over its territory, but denied that it constitutes a violation of its sovereignty. U.S. Global Hawk unmanned aerial vehicles have been used to collect intelligence and track drug traffickers, but only under Mexican supervision, according to a statement by the technical secretariat for the Mexican National Security Council. "Each of these actions is undertaken with full respect to the law," the statement says. The New York Times first reported that the Pentagon had begun flying high-altitude, unarmed drones over Mexico last month. The joint operation is designed to gather intelligence that can be acted upon by Mexican authorities. Such flights were responsible for obtaining information that led to the capture of several suspects in the February 15 slaying of a U.S. immigration agent in Mexico, the paper reported. The flights had been kept secret "because of legal restrictions in Mexico and the heated political sensitivities there about sovereignty," The New York Times reported.